BP Plc, Europe's second biggest oil company, and Reliance Industries will invest $5 billion in developing untapped gas reserves in the KG-D6 block as the partners attempt to reverse the fall in gas production. 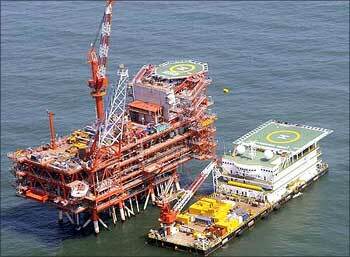 Besides detailing $5 billion investment plan over next 3-5 years, BP Chief Executive Bod Dudley and RIL Chairman Mukesh Ambani in their first joint meeting with the Oil Minister M Veerappa Moily may have also discussed the dispute with CAG over audit of spendings in flagging KG-D6 gas block. Dudley and Ambani in the meeting that lasted nearly an hour, briefed Moily of plans to develop 4 trillion cubic feet of gas reserves in the KG-D6 where production has dropped to about 19 million standard cubic metres per day, which is less than a third of 62 mmscmd peak hit in 2010. The duo, flanked by BP India head Sashi Mukundan and RIL Executive Director P M S Prasad, updated Moily of "joint future plans in India, including the KG D6 block enhancement plan designed to increase production from the block", RIL-BP said in a joint statement. While the investment in the new reserves, that lie in satellite fields surrounding the currently producing Dhirubhai-1 & 3 (D1&D3) gas fields and MA oil and gas field, will take 3-5 years, RIL-BP plan to augment current production next year by upgrading facilities at D1&D3 and MA fields. "They briefed (me) about their investment plans. I encouraged them to invest more to help in India's energy security," Moily told PTI. Moily, who was joined by Oil Secretary Vivek Rae at the meeting, assured expeditious decision making. He, however, refused to say if RIL-BP raised the issue of CAG's second round of audit of KG-D6 spendings. "You should focus on positive news rather than running after controversies," he remarked when asked if differences between RIL and CAG over the scope of second round of audit were discussed at the meeting. Moily had apparently come from Bengaluru last night only to attend the breakfast meeting with Dudley-Ambani and was on the way to the airport to return back at non when he was called by Prime Minister Manmohan Singh to attend the luncheon hosted in honour of visiting British Prime Minister. Leading the largest-ever trade delegation from the UK to any country, British Prime Minister David Cameron said: "BP is already the largest single British investor in India and the decision to join forces with RIL to invest $5 billion in the next few years into India's gas markets reinforces how two of Britain and India's leading companies can work together to invest in and supply the energy needs of the future, creating jobs and boosting prosperity." "Gas from these projects will deliver energy to millions of Indians and would significantly help India in reducing import dependence. My ministry is committed to provide necessary support to promote such investment in the domestic oil and gas sector. We will do the needful to fast track these projects and help them attain economic viability," assured Moily. Ambani as saying that his firm's partnership with BP was "focused on finding more hydrocarbons and addressing the complexities of the geology along the east coast of India." Dudley said: "We will bring all our expertise in deep water to explore the prolific gas basins in India and BP looks forward to a rewarding and successful exploration programme in the coming years." Sources with direct knowledge of the development said RIL-BP may have sought to strongly counter what they consider twisting of facts by certain quarters on the issue. They said there were disagreements on the scope of audit that cropped up on the very first day the Comptroller and Auditor General of India (CAG) began the second round of audit last month, as RIL felt the auditor was not confirming if the accounts scrutiny would be as per the provisions enshrined in the Production Sharing Contact (PSC). RIL points to Oil Ministry's written assurance that CAG would follow the audit process set out in Section 1.9 of the Accounting Procedure of the PSC and that it would not be a performance audit of the contractor. But CAG at the January 9 audit kick-off meeting did to give any such assurance. Sources said the CAG in the first round of audit for 2006-07 and 2007-08 has already audited about Rs 40,000 crore of investment and in the second round (for 2008-09 to 2011-12) only a small sum remains to be scrutinised and not Rs 25,000 crore as being claimed. KG-D6 gas pricing from April next year may also have figured during the meeting at Moily's residence this morning. With BP not comfortable with the Rangarajan Committee recommendation of changing prices every month based on international hub rates, Dudley may have sought clarity on the government stand on free market pricing of the commodity. RIL-BP statement said plans in work would require deployment of advanced skills, processes and technologies to produce gas from water depths of more than 1,500 metres. "RIL and BP are confident that development of the existing discoveries, together with exploration prospects in KG D6 have the potential to enhance domestic production significantly," it said. In an historic partnership with RIL in 2011, BP took a 30 per cent stake in multiple oil and gas blocks in India, including the producing KG D6 block and formed a 50:50 joint venture to source and market gas in India – India Gas Solutions Pvt Ltd.
RIL-BP said investment plans for the R-Series and Satellite fields in KG-D6 block have been submitted to the Government for approval and these projects would add incremental production from 2017 and beyond. Also, the two are drilling a prospect in the coming months to test a possible hydrocarbon pool below the current producing field. "If successful, this could provide additional reserves and be brought to production, potentially utilizing the existing infrastructure," it said. In addition, the KG D6 infrastructure has the potential to be a critical 'hub for the east coast of India. By the end of 2012, fields in the KG D6 block had produced 2 tcf of gas and 22 million barrels of oil, which would have cost more than $35 billion to import into India at current imported crude oil and LNG prices.